BASQUE INDUSTRY 4.0 is an initiative by the Basque Government to apply intelligence in production means and systems, to make the most of emerging capabilities and technologies in new products and processes, integrate advanced materials in higher-added value solutions or improved processes, resource efficiency and sustainability and the integration of high-added value services. From the moment SCUDER heard of this new strategy, they have been plotting how to help their clients, not only with the machine tool protection components that they manufacture, but also with solutions to control the machining processes involved; solutions that would help their technological development and thereby ensure their position in higher-added value market niches. 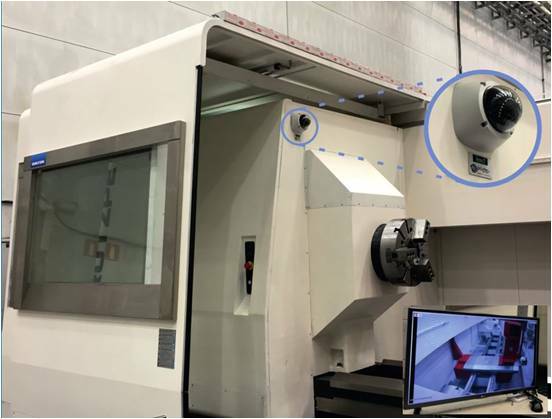 After careful consideration, they decided to research control and surveillance systems for machining operations in the market and verified that these were scarcely offered or implemented by their clients. They therefore got down to work and, in collaboration with AREA 7, a leader in security solutions and surveillance equipment, they developed a machine tool monitoring system focused on controlling machining processes by placing high-resolution cameras inside the machine that feed images to a screen at a control point conveniently placed on the machine itself or in a technical room, or to a tablet or mobile telephone at any other location. This system uses a video recording station in a high-resolution network (NVR) that feeds images in real time and recorded images from as many as 64 cameras for subsequent analysis. These cameras are not only resistant to splashes from cutting fluid, but are also equipped with remote control, zoom and infrared leds for viewing under adverse lighting conditions.